Nokia FIT. 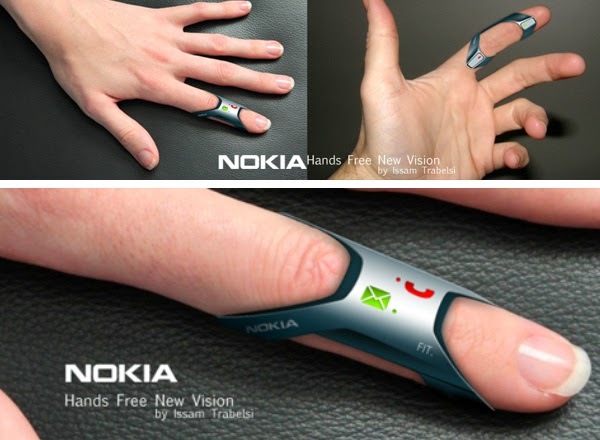 Concept is designed by Issam Trabelsi which avoids exposing ears along the day to the continuous Bluetooth radiations and reduces the excessive use of the hand-phone devices by fixing an optimized flexibility rubber coated device on finger, as a ring, this device is ergonomic because every part of it is fixed on separate phalanx. The first part integrates ergonomically and smoothly the speaker and the call acceptation switch, it is fixed on the distal phalanx. The second part fixed on the middle phalanx integrates the vibration mechanism, missed calls and unread messages LED indicators and the battery. And the third part is fixed on the proximal phalanx and integrates the call cancel switch with the microphone. This device works via Bluetooth as nowadays earphone, we use it simply like we use hand-phones.